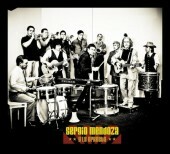 Tucson is privileged to have a group of great latin musicians. Here's the list of Salsa, Mambo, Son, Guaracha, Merengue, and Bachata local musical ensembles . The Combo Unico is a six piece Salsa band that Amilcar, Wladimir and Onofre started several years ago with the idea of experimenting with the traditional and contemporary rhythms of the Caribbean and Latin American Countries in general. Although it started as a “Charanga Band” it has been changing and developing through evolving styles of Orchestration. 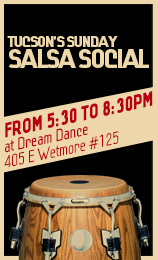 It is an energetic “Salsa” band, that is always “grooving”, and is therefore very appealing to the dancers as well as the listeners. 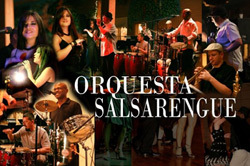 It is primarily a dancing band, but, because of the musical background of the musicians in the band it has some elements of jazz in it.Due to the enthusiastic response from audiences the band has been expanding its venues, creating more opportunities for salsa dancers to take advantage of. All the members of the band are fine musicians with all different music backgrounds. d with the flavor, passion and energy that Salsarengue puts in all their songs. Tony Thomas explain that his goal as leader of the band is to make music that everyone will enjoy for years to come and to become an institution like so many others have done with this music we all love and call.........SALSA. most capable and knowledgeable Latin musicians. Most importantly, "Tito" is comprised of upmost professionals within the music industry. "Tito" brings you authentic sounding music and is one of the most versatile bands. Not only do they bring you Cuban and Puerto Rican rooted rhythms, but also Columbian and Dominican such as Bachata, which is a style of music rarely performed by Salsa Bands. Latin Jazz is certainly within "Tito's" versatile song selections as well. When requested, Tito Y Su Nuevo Son also has an abundant R & B, Pop, Pop Rock, Mexican Cumbia and Mexican Pop song list in addition to it's already versatile repertoire. "Tito" has performance experience at Jazz Festivals, Weddings, Dance Venues and many types of other occasions. On September of 2010 at the Downtown Latin Jazz Festival in Tucson, AZ, Tito Y Su Nuevo Son had the honor of playing behind legendary pianist for the Fania All-Stars, Larry Harlow. For simply great Salsa/Son Music, look no further.